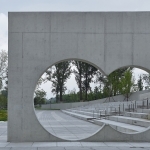 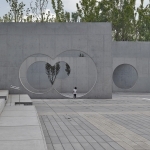 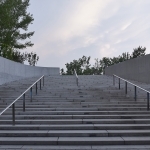 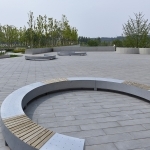 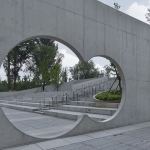 The project is located in the central area of the main square of the park in Changping Future Science City. 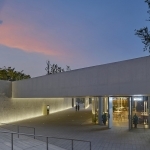 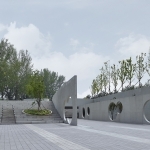 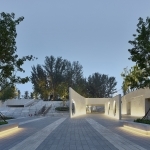 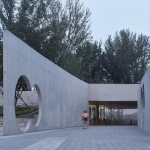 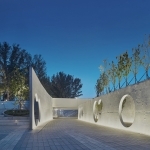 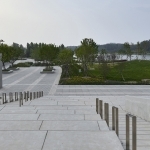 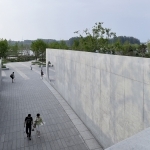 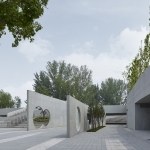 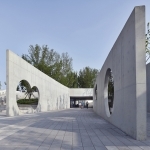 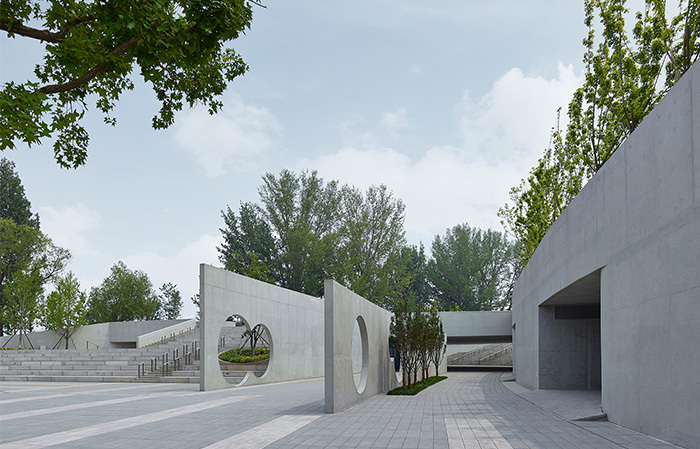 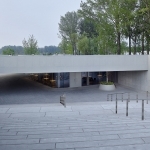 The visitor center is set under the platform of the square, the south side is the tree-shaped plaza in the park, the north side faces the revetment and the park lake, the tree-shaped platform on the west side extends to the sports center, and the east side echoes the exhibition center. 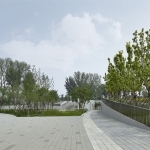 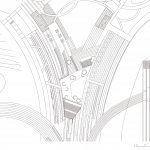 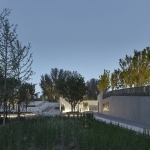 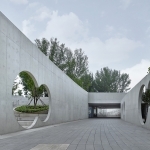 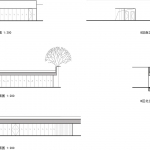 The design of the project combines the modern and concise architectural language with the traditional Chinese garden conception, linking the architecture and the landscape in an ingenious and organic way. 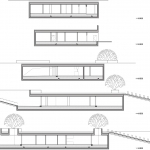 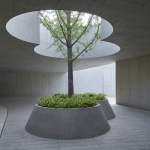 By utilizing the height difference of the tree-shaped square platform to fully integrate the whole building with the environment. 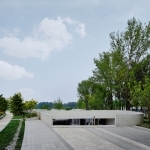 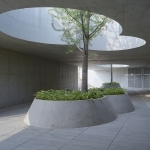 Meanwhile, some ‘hidden’ method such as sinking the ramp has been adopted to reduce the visual impact of the building on the environment and make the building an inseparable part of the landscape. 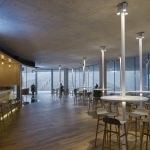 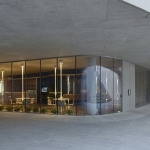 For the façade material, fair faced concrete is contrasted with the glass curtain wall, highlighting the modern and concise architectural style. 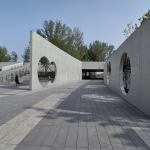 As an auxiliary facility of the entrance to the park, the visitor center is divided into two parts. 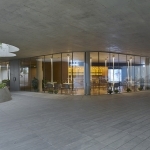 The east side of the Zone A is set with service halls, sales, office, cleaning, storage and other functions. 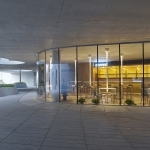 In the Zone B on the west side, facilities such as public restrooms, dressing rooms, shower rooms, plant rooms and weak current distribution room in the park are set up. 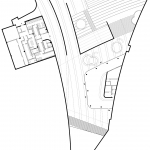 The main entrances of Zone A and B are facing the passage of the middle part, and the two landscape arc walls guides the flow to the north side. 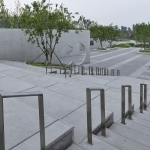 There are two secondary entrances and exits for evacuation purposes in the north side of Zone A to the outdoor courtyard and the south side to the entrance courtyard. 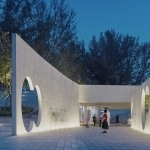 On the north side of Zone B, a secondary entrance for logistic staff and fitness personnel in the park is set up through the guidance of the landscape arc wall. 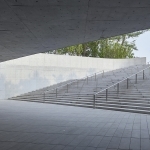 More: 胡越工作室。 更多关于：Hu Yue Studio on gooood.